People know so little about Prasanna Jayawardene. When did you first take up the game? I was bitten by the bug at a young age, and knew I wanted to play for my country. I used to knock the ball around in our small house or outside in the garden with siblings and cousins, but the focus was always on wicketkeeping. It came to me when I was very young. It was just something that felt right. I think I was a natural [keeper]. Who were your early heroes? Watching the 1996 World Cup was very special, and seeing Romesh Kaluwitharana bat and keep wicket was inspiring. Then of course there was Ian Healy, who was my main hero. I love Healy. I used to watch him any chance I got on television. I spoke to him in Australia in 2007, and he gave me some good tips. We discussed feet movement and keeping to legends like Warne and Murali, as well as his experiences of playing all around the world. He said I had excellent anticipation and footwork. I was very happy that day. It seemed like you were fast-tracked into the Sri Lankan team after touring England with the Under-19 side in 1998, but you stepped back after Kumar Sangakkara's arrival in 2000. Then there was the return of Kaluwitharana. Like Adam Gilchrist and Brad Haddin, you have had to wait on the sidelines. It was an extremely difficult time. You know how good you are, but you watch guys come ahead of you. At that time the selectors told me to focus on my batting, so I went back to the domestic circuit and worked hard. I made my Test debut in 2000 in Kandy and I didn't do anything in that game, but after that I didn't get a chance. A week after my Test debut I was dropped. In 2002 I got another chance, but for a couple of games only, and then in 2004 a couple more, and so on. It was very frustrating. Wicketkeeping is a tough job. It requires a daily routine and you'll only improve when you play at the highest level. If you get a match or two every couple of years, it just won't do. How much of this constant in and out was due to your inconsistent batting? In hindsight, probably a lot. My wicketkeeping was fine, I'd like to think. Earlier in my career my coaches told me I had problems with my footwork… that I was too early into the shot with my front foot - basically that I was bringing my front foot too early. I worked on that. I was told by my coaches that there was little wrong with my technique but that I had to start scoring runs. You made your first-class debut after the World Cup, with Nondescripts Cricket Club. Then you changed clubs four times and struggled to find a permanent batting spot at any of them. At NCC there was lots of talent. My role was mostly behind the stumps. I did not score a lot of runs, but kept my place because of my wicketkeeping. There were limited batting opportunities, so that allowed me to concentrate on my keeping. But then my batting suffered. I lost my place and moved to Sebastianites, where I could bat at No. 3. I then moved to Sinhalese Sports Club. I was there for one season and then moved to Colombo Cricket Club to see if I could cement a permanent place. That didn't happen and I went back to NCC and spoke to Sangakkara. With him away on national duty I got plenty of time to keep wicket, but at No. 8 my batting suffered. Then I moved to Bloomfield, where I liked the environment - and it showed as I began to score runs. I scored runs with Sri Lanka A as well, and that put me back on the map. I haven't left Bloomfield since. "You have to watch the ball very closely and properly, and make sure never to go for it early. It's about patience, but there's hardly any time to reach. You have to look at the line and length, and then wait for the ball to come to you. But then when you do go collect it, you've got to be very fast in doing the next part, especially down the leg side"
What is your relationship with Sangakkara like? Sangakkara is a real gentleman. He's been very kind to me, and he's the one who gave me this chance. I'd have probably never got it without him. That was an important series, more so because I scored runs. We also had some tense periods in the field and Murali bowled a lot of overs. It gave me a lot of confidence - especially because we won. India's tour in 2008 was a key one for you. You were keeping against Ajantha Mendis in his first series and had Murali bowling too, and you did very well. Your stumping of Gautam Gambhir at the SSC stands out in the memory. You also scored runs in tough situations. Was that a confidence-boosting series? Murali is a legend and keeping to him has always been special, and in that series suddenly Mendis arrived. But because I'd worked so hard at my wicketkeeping over those rough years I didn't find keeping to them so hard. I did the basics well. I watched the ball and I waited. And I didn't have much problem reading Mendis. He hardly bowled a bad ball, which obviously helped me. I'm good at judgment, and I've worked a lot with Murali. You pick up small cues and you make sure you remember them. I did not drop a single catch off the two of them. It was a good series, personally. Many former and current international players, including Healy, say you are the best when it comes to standing up and keeping to spinners, because you are so light on the feet and soft with the hands. Keeping to spin is the most difficult, but it is also extremely satisfying if you do it well. I have to do the basics well against every spinner, be it Murali or a club bowler. That is how I have always gone about it. I cannot afford any mistakes. Especially with Murali and Mendis in Tests, I have to keep focused. I cannot relax. Healy says wicketkeeping is a lot about powerful sideways movement. You are very light on your feet, especially against spin. Do you move on the heels or on the balls of your feet? I try to stay low, to rise with the ball. I move on the balls of my feet. If you move on the toes it can upset your rhythm. I also try to just watch the ball, purely the ball. From the hand, where it pitches, what it does off the pitch. You have to forget about the batsman in front of you. It's tough. How much of wicketkeeping is about anticipation? Wicketkeeping is about being late and fast. You have to watch the ball very closely and properly, and make sure never to go for it early. It's about patience, but there's hardly any time to react. You have to look at the line and length, and then wait for the ball to come to you. But then, when you do go collect it, you've got to be very fast in doing the next part, especially down the leg side. I don't think I've ever seen you go for a catch one-handed. A one-handed attempt is not safe. You must try to go for the ball with two hands. Wicketkeeping is about safety. Do you count your drops? I want to take every chance, even at the club level. If I drop one I feel very guilty and I remember it for long after the match. It adds pressure. No I don't. I just focus on wicketkeeping. It has happened that I am appealing too much and the batsman has come after me, saying various things. It does get me aggressive and a little bit talkative. But I try to keep my cool and focus. A wicketkeeper is the side's motivator. Watching you on television and live, we've not much seen you in discussion with the bowlers or the captain. In fact Ranjit Fernando, a former wicketkeeper, says this is one area where you lack. I am fully involved in the game. I do have chats with the captain and the bowler, but generally our bowlers have done the right things so I haven't had to suggest what to do. Earlier my confidence may have been affected, somewhere deep inside, because of the few matches I had played. Coming to your batting, we've seen on a few occasions that you have come to the crease and taken pressure off the senior partner by rotating the strike and playing your shots. I remember seeing you do this against South Africa in 2006, England in 2007 and against India last year. The last few series I got runs in difficult situations, and I think I scored them at a good rate. But there also hasn't been a lot of pressure because in most cases by the time we are five or six down we have at least 500 on the board. So that way I don't get a chance to do much. If we are 90 for 4 or 100 for 5 and I walk in, then I have to do something. When such situations have happened, I have done well. 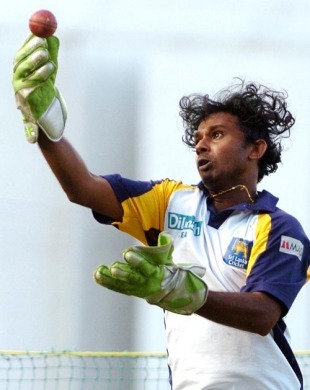 Mahes Goonatilleke, who is widely regarded as the finest wicketkeeper produced by Sri Lanka, says you are a sharp listener and learner, and has no doubts that you are the best wicketkeeper in the world. He also told me it is a misconception that you are not a very good batsman. I spent some time with him and he gave some useful tips. We worked on ball collection, anticipation, reflexes and such. It's an honour to be compared with greats from the past, both Sri Lankan and international. See, as I said before, having to bat so low in my club level, initially my batting suffered. But the hard work has paid off. I admit I went though a phase of scoring 30s and 40s in Tests, but I think the maiden Test century, against Bangladesh, showed I could deliver. My batting against England was also decent. In the past I've been accused of not scoring enough runs as a wicketkeeper. I have a ways to go, but I am confident of where I am at.